This masculine card was made using the slapstick/Cling stamp by Penny Black - Life is Simpler. 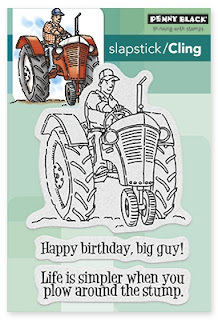 The image was stamped on white 110lb cardstock and then colored. I stamped the image a second time on Inkadinkadoo Stamping Mask Paper. I then fussy cut the image as closely as possible , covered the colored image and used Tim Holtz distress ink for the sky and ground. To create the glowing line I covered the sky with a fussy cut piece to create the ground line... I used the opposite piece moving it down a bit to then blend the sky and kicked up dirt. I cut then cut the the image 4 1/8" by 5 3/8". I cut red card stock just shy of 4 1/4" by 5 1/2". 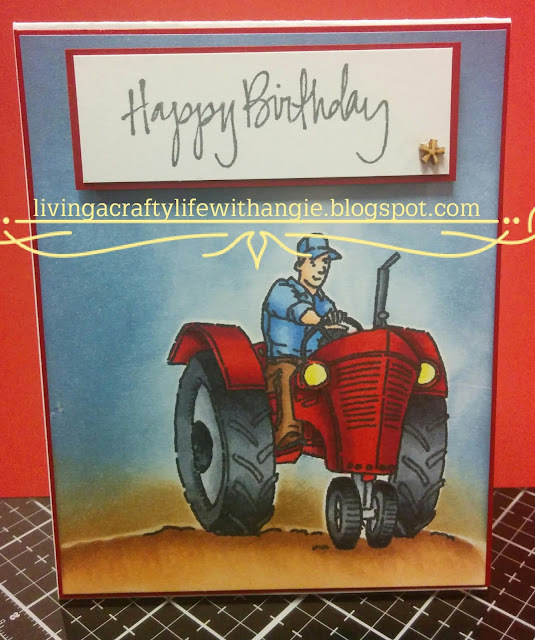 I used a "happy birthday" sentiment stamp and created a border using a slightly larger piece of red card stock. I added foam and adhered to the card base. I added a tiny wood piece.